There is just something really special about a perfectly cooked scrambled egg. So light, so fluffy and incredibly delicious. Your mouth just waters thinking about them. Now, try going out to breakfast at a locally favored restaurant, literally with that wonderful taste in your mouth only to discover that their eggs, are dense, flat and greasy. These were not the eggs you were dreaming of. Quite a letdown, right? So why not learn to make scrambled eggs yourself and save a ton of money in the process. The key to this whole process, besides the eggs, is the handheld blender. This is what will make your eggs so light and fluffy. To begin crack several eggs into a large drinking cup, and add a splash of milk. Insert the handheld blender and mix until frothy. Place your frying pan over medium heat, and melt a pat of butter over the bottom of the pan. Pour the egg mixture into the pan, and let sit in the pan for 15 seconds. Then using your spatula or wooden spoon begin to stir around the mixture so that it does not burn to the bottom of the pan. Continue to stir the mixture around until the eggs have solidified to the point that there is only a small amount of liquid left. This ensures that the eggs will stay light and fluffy. Turn off the heat, and season the eggs with salt and pepper. Slice the green stem portion of a green onion and garnish if desired. Serve with bacon, hash browns, toast, or whatever side dish you prefer. Cost: Less than $1.00 per egg serving for two eggs. When you want to have donuts, but you’re tired of the same old ones from the grocery store, why not try making some yourself? It’s as simple as the cake mix in your pantry. I’ve done this often and it works quite well. Over the years, I’ve learned a lesson or two to get the right consistency and make it yummy too. The deal with a pre-packaged chocolate cake mix is that it takes the guesswork out of preparing it from scratch. While I am all for making things from individual ingredients, but baking is really a science, and in the morning, I want to make something easy and quick. Preheat the oven according cake mix package. Using a stand or hand mixer, prepare the cake mix using one less egg and half of the water and oil as required on the box. By doing this, the mix will be a more dense like a donut and less cake-like. Add the chocolate pudding mix. This will add the extra lusciousness to the batter. Spray the donut pan with the non-stick spray. Spoon or pour the batter into the donut pan and place into oven to bake accordingly. Watch the donuts and when they begin to pull away from the sides of the pan, remove from the oven. To check they are baked all the way through, insert a toothpick. When it pulls away clean, the donuts are done, otherwise bake longer as necessary. Cool donuts and then turn pan over release them onto the wire cooling rack. When they are mostly cooled, frost donuts with chocolate frosting or other flavored frosting of your choice. Where can you go to get breakfast for under a $1.00? That's right! Less than $1.00 actually. 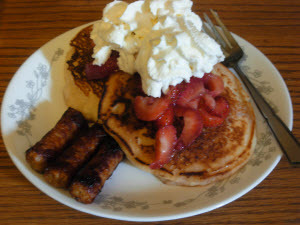 Strawberry Pancakes is so easy to make. The trick is let the batter rise for about an hour, otherwise they will feel like boat anchors. Take your favorite pancake mix, Bisquick works, but because we live in Northern California, we chose Krusteaz. Follow the directions to make the batter. Let the mix rise in the bowl for about an hour. Prepare the strawberries by washing then slicing them. Add sugar to taste to allow the juice to happen. About 5-7 minutes before starting the pancakes, prepare the sausage links according to the directions. When finished, place on a plate covered in paper towel to absorb the grease. Place in a warm oven to keep hot. Cook the pancakes according to the directions. Place on a plate, top with the strawberries and add whip cream. Add the sausage links and you've just prepared a scrumptious breakfast for less than $1.00.